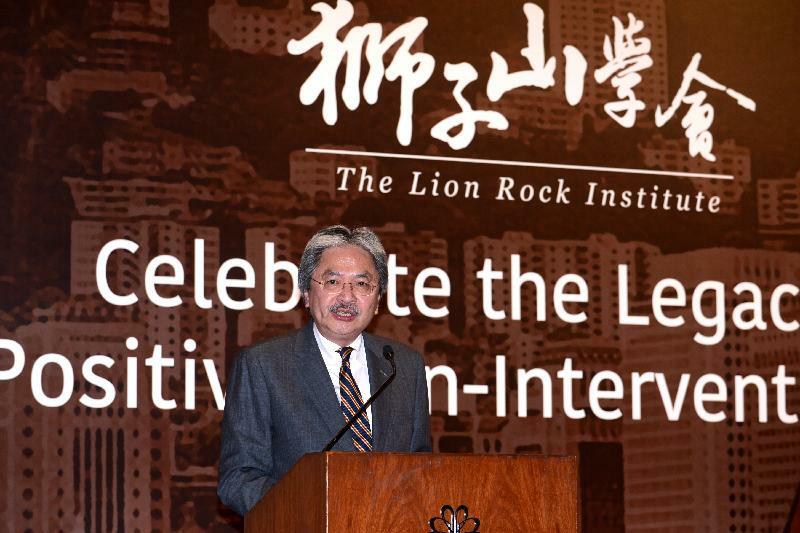 I am pleased to join you all, once again, at the Lion Rock Institute's Annual Gala Dinner, to spend an evening with fellow true believers who cherish free-market values with a passion normally displayed only by hard-core fans of Manchester United. Even tonight's menu somehow underlines that commitment to freedom. The slow-roasted beef tenderloin must have been extracted from cows that were free to range day and night munching on grass, and free to sleep wherever and whenever they wanted to. As for the pan-fried codfish, I am sure only the free and wild kind has been selected for us free-marketers' consumption. 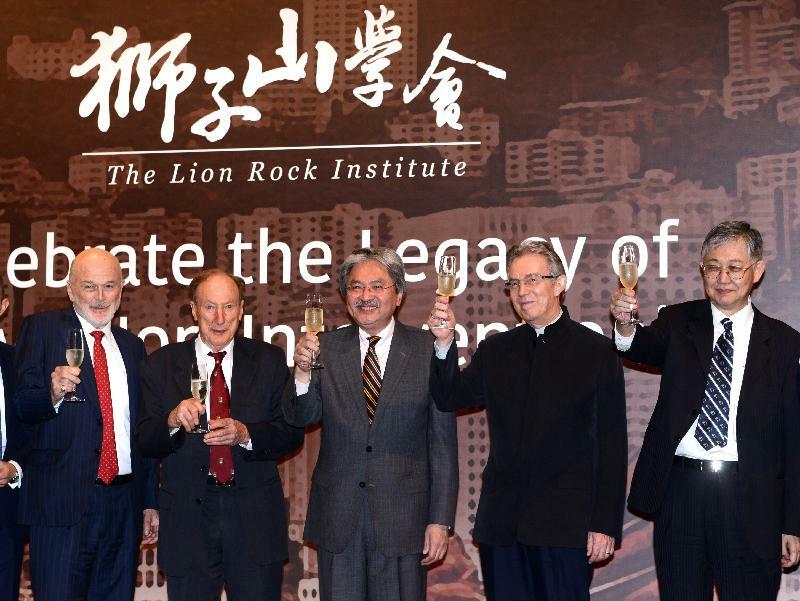 We would surely expect nothing less from the Lion Rock Institute. As for me, the dinner tonight is also free. Putting aside all those fine "free" elements, I am, indeed, pleased to attend once again this annual ritual, perhaps the only ceremony in Hong Kong, this very cathedral of freedom, that openly honours the power of the free market, reaffirms the benefits of free trade, as well as celebrates the beauty of economic freedom. The free market principle has always been the fundamental ingredient of Hong Kong's continued prosperity, the cornerstone of our sustained achievement, and the bedrock of our own brand of economic achievement as an international commercial, trade and financial centre. And earlier this year, the Washington-based Heritage Foundation has also named Hong Kong once again the world's freest economy in their annual Index of Economic Freedom guide. They have done that for the past 22 years in a row. Upon receipt of these welcome acclaims, we don't show any extraordinary emotion or excitement, like running victory laps or tapping out exotic dance steps. We would issue the usual press statement, one that is plain, straightforward, informative and totally bureaucratic. Nothing more, nothing less. Perhaps our upbringing in a society that teaches us to be humble and subtle has a great deal to do with this behaviour, but we do take great pride in these honours, and we are grateful to these esteemed organisations for recognising our underlying strengths and giving us a thumbs up for our stubborn insistence. These are all nice and pleasant, but more importantly, these reaffirmations have enabled us to stay the course in plotting our programmes for the future, and in continuing to employ the values of free trade and the free market in shaping the economic policy of Hong Kong. Britain's referendum in June in favour of Brexit, as well as the result of the US presidential election that came through last week were perhaps the clearest indications that sentiments against the open market and free trade are fast rising, fiercely refuting the achievements of many decades of increasing globalisation. Picking up on this gathering storm, the Economist recently argued that the new divide among rich countries is no longer between left and right, or liberal and conservative, but between open and closed. In an editorial asking rhetorically who would uphold the torch of openness in the West, the paper lamented the world's "depressing company of wall-builders, door-slammers and drawbridge-raisers". It wasn't so long ago that globalisation was that unstoppable force that was quickly reshaping the world. And all of us here this evening know well that the liberalisation of trade, investment and immigration policies, together with the freer flow of goods, capital and people, have served to raise production efficiency, creating an increasingly connected global market that optimises on each economy's unique strengths. Over the past 20 years, global trade in goods and services has tripled in volume. China has been a major beneficiary. The Mainland of China's per capita GDP increased 13 times over those two decades. Its rural population, generally poor in nature, fell by more than a stunning 100 million between 2010 and 2015. And that telling progress has also been visible in other emerging economies, such as India, Indonesia and Vietnam. Despite these achievements, today's persistently weak global economy continues to batter free trade, eroding its primacy and its international reputation. Our trade is more than four times our GDP, making us the world's most open economy and the eighth-largest trading entity. Without free trade, it is highly unlikely that we would have emerged as an advanced economy and an international financial centre. More importantly, I believe education is the equaliser that accords everyone, rich or poor, the same opportunity to excel, that optimises everyone's potential, and that gives members of the younger generation a fair chance to succeed. Through education, we are seeking to create a fair and level playing field for everyone in our community. Indeed, education has been the single largest recurrent spending area in my annual Budget. Our education expenditure this year, by the way, is some 70 per cent higher than it was a decade ago, while the student population, you may not be aware of this, in primary and secondary schools for the corresponding period has dropped 20 to 30 per cent. We are making a difference. The proportion of Hong Kong's workforce with tertiary education has increased from 29 per cent in 2005 to 38 per cent last year. That is a big leap in terms of quality of our people, and in terms of our ability to cope with a fast changing world. In order for the new generations of young people to better themselves and their families, and to further improve the conditions of our society, we need to workrelentlessly in safeguarding and maintaining Hong Kong's many long-standing strengths, from our open and globalised market environment, our rule of law and independent judiciary, our transparent regulatory regime and our level playing field for all to our community-wide distaste against corruption. These institutional strengths also give our businesses the resilience, and give our businesses the confidence, to tackle the global economy's many ups and downs.